Nipsey Hussle's Hotep Logic: Did we not leave homophobia in 2017? Nipsey Hussle’s Hotep Logic: Did we not leave homophobia in 2017? After hundreds of articles, Facebook posts, Twitter threads and protests, here we are in 2018 STILL discussing homophobia in hip-hop, and for that matter, the Black community at large. It has been said in every way possible that being a Black gay man is in no way emasculating, nor does it contribute to some imagined destruction of the Black community. Yet still here we are just several days into the new year discussing this foolishness again. For the people in the back, this one is for you. 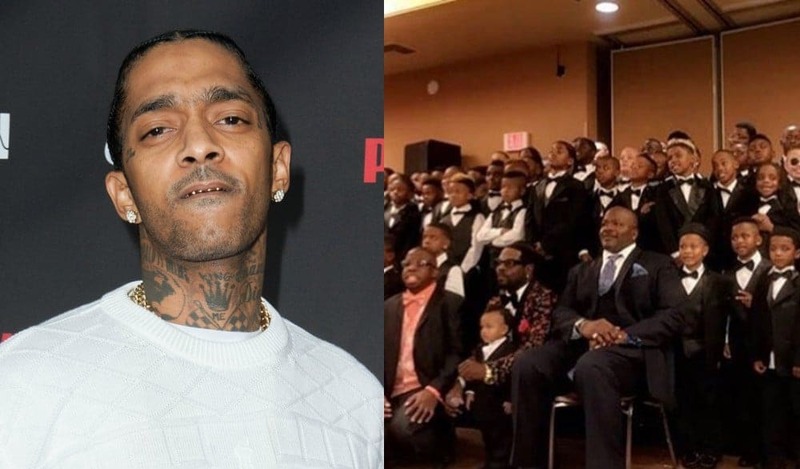 On Instagram earlier this week, from rapper Nipsey Hussle (you will likely have to Google him as I did) an argument is made that more images of Black men and boys in suits is what community needs to fight against the stereotypes that we are hyper-violent, abandoners, and “homo sexual”–yes, I spaced “homo” and “sexual” as he did in the post. I get it, we want more representation. We want to make sure our community is allowed to see more images of Black men outside of what TV and media portrays us to be. However, I’m uncertain that a photo of about 100 Black men and boys dressed in suits achieves that goal. Much in the same way being a nicely dressed Black men doesn’t mean you can’t be hyper-violent, an abandoner, or homosexual. But to be clear: being a homosexual should never be mentioned in the same sentence as men who exhibit violence and abandonment. I, too, was a little Black boy dressed in a suit with other “respectable” Black men. As a member of Alpha Phi Alpha Fraternity, Inc., I’ve taken countless pictures just as the one Nipsey posted with young mentees and older gentlemen throughout the organization. I am also a homosexual. Homosexuals can wear suits. The way in which one dresses doesn’t diminish nor embolden one’s sexual identity, and shouldn’t play a role in what determines respectability of men within our community. I’m certain the men in the photos come from all walks of life, with varying faults and failures. Respectability politics will not save us, nor will we gain freedom by continuing to condemn our own while forcing the image of the Black man. We are not a cookie cutter monolith, and any suggestion that we are is only a byproduct of colonization and assimilation. Now Google Gabriel Fernandez, who’s caretaker murdered him “thinking” he was gay at the age of 8 years old. Then take a look at Abdel Cedeno, who finally snapped after years of bullying and killed two of his tormenters. Nobody won in that situation either. The intersection of being a little Black boy in America comes with a multi-layered oppression that many, unfortunately, do not survive. Black boys are committing suicide at double the rate of that 20 years ago between the ages of 5 and 11. The real emasculation of Black men and damage to our community is not being done by those who are gay, but those who continue to use homophobia as a vehicle to commit intracommunity violence and oppression. Homophobia has been thoroughly discussed through and through and the choice to not acknowledge it, respect it, and leave us to our own lives only shows that there is internal work that needs to be done by the homophobe. Not additional teaching needed from the homosexual. The unwillingness of the close-minded, homophobes to receive what has been taught can no longer be our oppression. Too many have died, and countless more will continue to die if folk like Nipsey don’t check their dangerous Hotep logic at the door. At this point, it is understood that people like Nipsey Hussle, and those like him, will never come around to those who are gay. As important as it is to pushback against people who do not accept us as we are, we must also learn to live and love folks from a distance. Homophobia has no place in our community. So, leave that BS in 2017.